We were at the Connection Conference & Event Centre (CCEC) at Bangsar South recently for the unveiling of the winners of Guardian People’s Choice Award (PCA) 2016 and also celebrate Guardian’s 49th Anniversary. Continue to read on if you would like to know which is the best brands and the winners Guardian People’s Choice Awards 2016? The wait is over! In conjunction with Guardian’s 49th Anniversary celebration, Guardian PCA 2016 brings the crème de la crème of brands under one roof from personal care and cosmetics to health care and confectionery. The glamorous night opening performance was by Dennis Lau, the talented electric violinist who awed the audience with his musical skill. Heavyweights of the health, beauty, and pharmaceutical industry received appreciation for their most popular products, where category winners took home the sought after Guardian PCA trophy. Aside from awarding the People’s Choice Awards to the respective winners, leading brands were saluted for their outstanding success with the Guardian’s Special Recognition award. 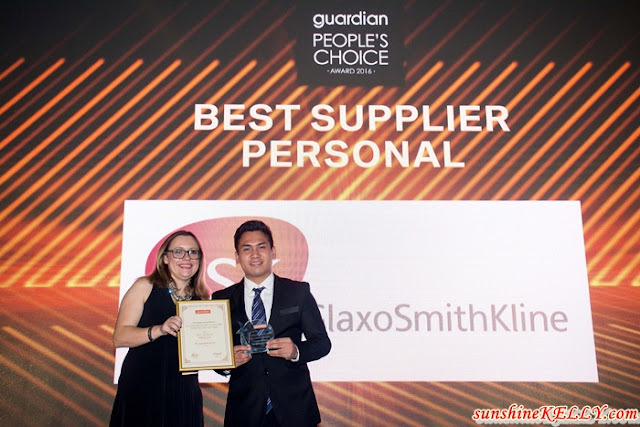 GlaxoSmithKline Consumer Healthcare Sdn. Bhd. proved to be the contender of the year, and was given the nod for Best Supplier for Personal Care as well as the grand title of Best Overall Supplier. The Best Supplier for Beauty award went to the brand that proved to be the undefeated household name, Ginvera Marketing Ent.Sdn.Bhd. And the Best Innovation title went to Reckitt Benckiser (Malaysia) Sdn. Bhd. for Dettol.